I know for many unattached people, Valentines Day seems like a holiday geared to make them feel bad about not having someone "special" in their life. However, I thought that, perhaps, knowing some of the history surrounding the holiday and a few important suggestions might give folks a different perspective. What you will find on this page. . . Suggestions of things you can do the help others. What does the history of Valentines Day have to do with home organizing? Often when we feel bad, shopping tends to be the panacea for our problems. It gives a temporary "thrill" of having something new that makes us feel handsome/pretty/attractive to others. This leads to empty pocket books and cluttered homes (read about this in the article I Hurt/I Buy). History of Valentines Day -- Who was St. Valentine? St. Valentine may have been only one person or a combination of the stories of several individuals. 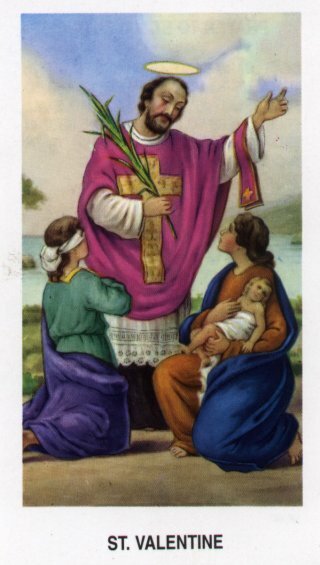 The origin behind St. Valentine is somewhat of a mystery and the historical data is a little fuzzy. Some historians indicate that he was a Roman martyred for refusing to give up his Christian faith, while others say he was a temple priest jailed for defiance during the reign of the Emperor Claudius II. It's possible that both incidents refer to the same person. Did he really exist? Most likely, yes. Archaeologists have unearthed a Roman catacomb and an ancient church dedicated to Saint Valentine. Also, in the year 496 AD, Pope Gelasius marked February 14th as a celebration in honor of his martyrdom. The first artistic representation of Saint Valentine appeared in a The Nuremberg Chronicle (an illustrated book printed in 1493). The Nuremberg Chronicle depicts a woodcut portrait of him with text that states Valentinus was a Roman priest martyred during the reign of the Emperor Claudius II "the Goth." Stories about his life indicate he was caught marrying Christian couples and aiding any Christians who were being persecuted under Emperor Claudius in Rome. Others say he was martyred for trying to convert the Emperor! Once again, all these stories could be true of the same person. Many miracles are attributed to him. Of the various legends, one in particular may have lead to the first "Valentine" being given. It says that, While in prison, Valentine fell in love with a young girl (possibly the jailor's daughter who visited him during his confinement). It is believed he wrote the first "Valentine" to her on the eve of his death. He penned a farewell note to her signing it, "From your Valentine." Valentine was (and is) one of the most popular saints in England, France and other parts of Europe. Some believe that February 14th was chosen to celebrate Valentine's Day to commemorate the anniversary of Valentine's death or burial (possibly around 270 A.D.). Some claim that the Christian church may have decided to celebrate Valentine's feast day in the middle of February in an effort to 'Christianize' celebrations of the pagan Lupercalia festival. Both are probably true. Now you know the history of Valentines Day! But . . . how does this help you survive Valentines Day? Here's my suggestions based on many years of being single on Valentines Day. No Pity Party The best thing you can do is not to hold a "pity party for one." Remember, being in a relationship is not a guaranteed cure for loneliness. Visit a nursing home or assisted living facility. Call a local church and ask the pastor how you can be of service. Taking the focus off yourself and onto others will help you feel better and keep your home and your life less cluttered! May this history of Valentines Day give you new inspiration for a bright future.